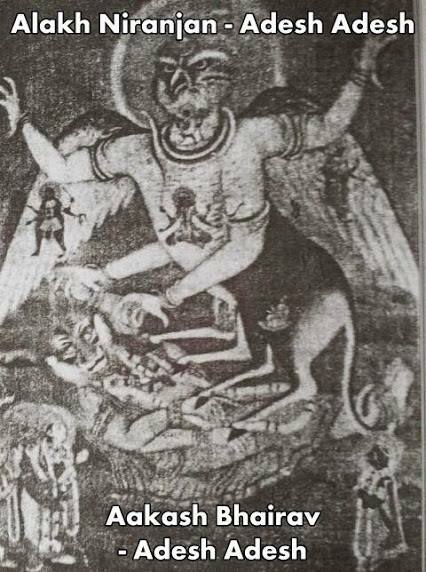 IT was the time when Demon Hirynakashypu was filled with so much false ego that he declared himself GOD. His son Prhlaad tried to open his eyes, but he ordered to kill his own Son. 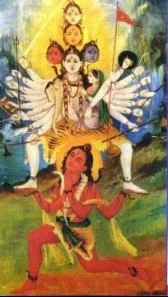 This avatar of Shree Vishnu was very fierce and full of energy and anger. Narsimmah killed Harynakashypu easily but his anger did not subdue. The might of this avatar was that much that the three worlds trembled. Narsimmah started destruction as never seen before. No force could have stopped Him. Bhrama ji asked Prhlaad to go and try to cool the anger of Narsimmah. Prhlaad went in front of Narsimmah and prayed to cool down. But Narsimmah embraced Prhlaad, and continued the destruction. Worried GODS and Deities went to Aadi Shiva for help. Shiva understood the importance of stopping Narsimmah. 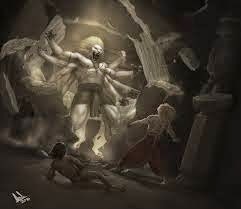 Aadi Shiva ordered his ganas Bhairav and Veerbhadra to stop Narsimmah. Bhairav and Veerbhadra appeared in front of Narsimmah and praised him. They requested that Hirynakashypu was dead and requested to calm down. They asked him to remember that HE is Shree Vishnu the protector of the universe. 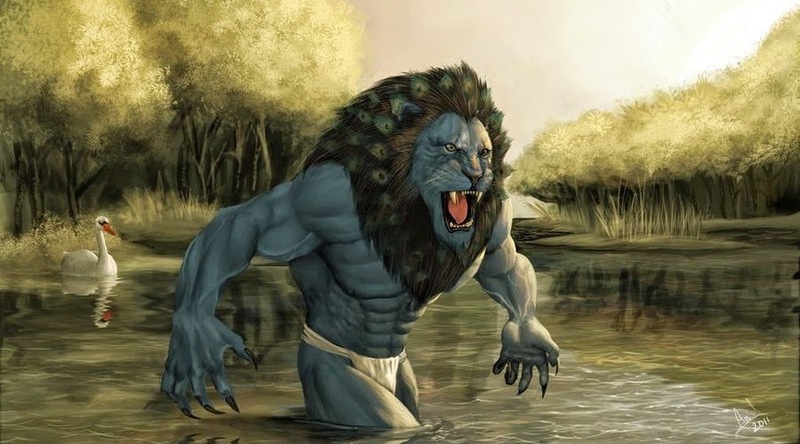 Narsimmah was not in a condition to listen them and instead calming down, HE pounced upon them. Suddenly Aadi Shiva appeared between Narsimmah and Bahirav & Veerbhadra. 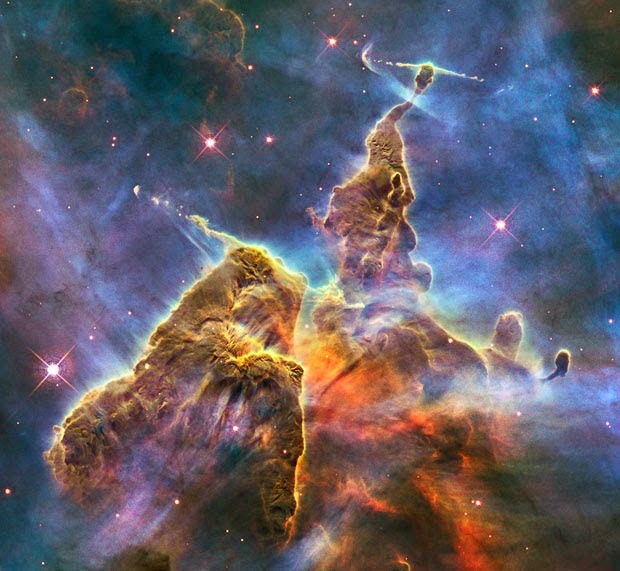 All the GODS and deities and other heavenly bodies were surprised on seeing it. Shiva was in very fierce form. He was looking huge with 1000 arms. He was in a form of a huge cannibal Bird. His was named Sharabha. 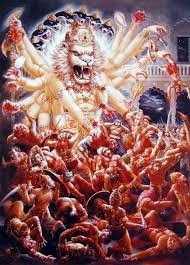 Shiva Purana describes Sharabha as thousand-armed, lion-faced and with matted hair, wings and eight feet. Sharabha Upanishad portrays Sharabha with two heads, two wings, eight legs of the lion with sharp claws and a long tail. Kalika Purana describes Sharabha as black in color, with four feet downwards and four feet uplifted, with an enormous body. It also has a long face and nose, nails, eight legs, eight tusks, a cluster of manes, and a long tail. It jumps high repeatedly making a loud cry. 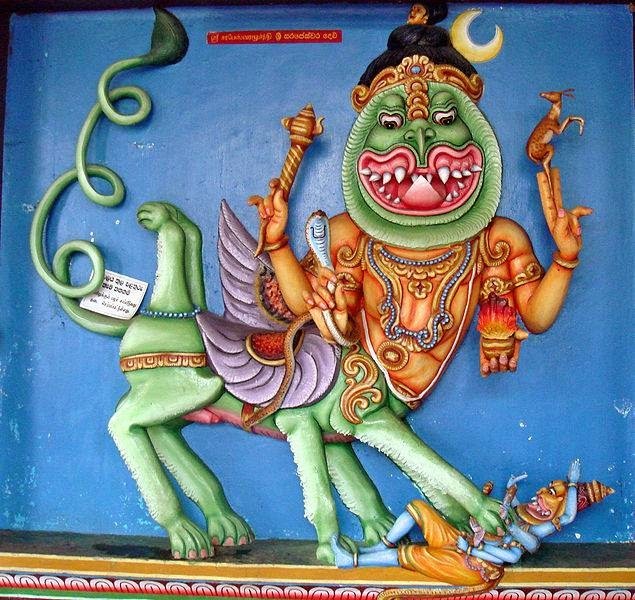 The iconography of Sharabeshwaramurti (Shiva as Sharabha) is specifically defined in texts such as Khamikagama and Sritattvanidhi. 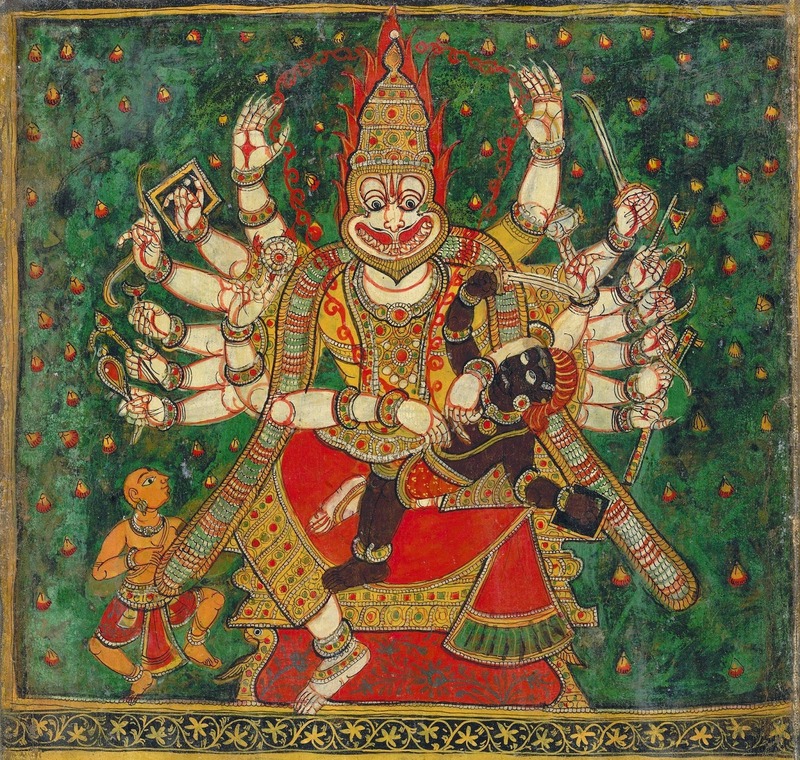 In the Sritattvanidhi, the depiction prescribed for Sharabeshwaramurti is of thirty arms; arms on the right are to hold thunderbolt, mushti, abhaya, chakra (discus), sakti, staff, goad, sword, Khatvanga, axe, akshamala, a bone, bow, musala, and fire; and the left hands to display noose, varada, mace, arrow, flag, and another type of sword, a snake, a lotus flower, skull-cup, pustaka, plough, and mrudanga with one hand encircling Durga in a hug. This form is extolled to usher good luck, cure all diseases and destroy all enemies. 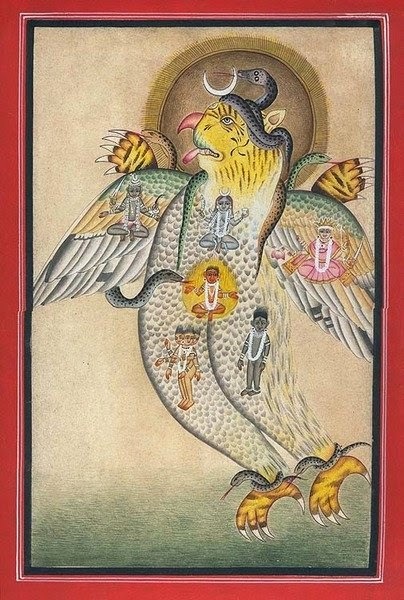 Sharabha injured Narsimmah with HIS wings, and caught HIM in his huge claws. Narsimmah got so frightened that he became unconscious. Sharabha caught him and flew in sky. Narsimmah gained conscious and his anger had vanished. He left the body of Narsimmah and appeared as Shree Vishnu. In this Vishnu form HE eulogized (Praised highly) Aadi Shiva. This pleased Shiva very much. He also returned in usual form. On listening this, sages requested Sutji to narrate other incarnations of Shiva too. 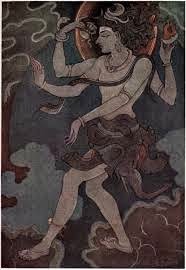 Aadi Shiva had taken innumerous incarnations, but I will narrate a few important ones. The five incarnations are very important ones and all sages should know about them. 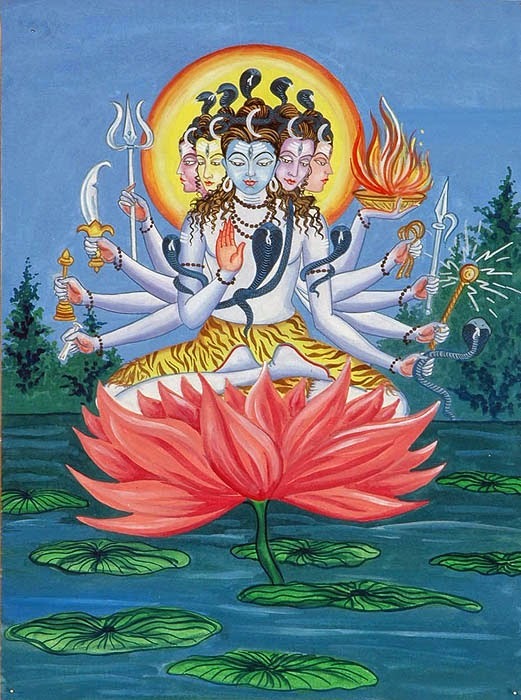 In every Kalpa, the Brhamaji was born on Lotus (Kamal) from the navel of Shree Vishnu. Initially the whole universe was submerged under water (Which appeared from Shree Vishnu’s body as the result of his great penance) A heavenly voice suggested Brhamaji to meditate. 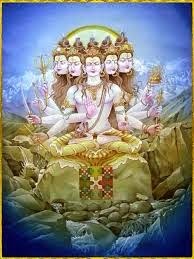 In each Kalpa Shiva incarnated and blessed Brhamaji with the power of creation. During the nineteenth Kalpa, Shweta Lohita Kalpa, Brhamaji was in deep state of meditation. From him appeared Aadi Shiva in a physique form. He was white in complexion. On seeing HIM, Brhamaji praised HIM with great devotion and named him Sadhojat. 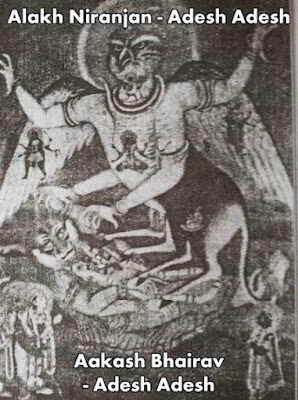 This avatar of Aadi Shiva was named Sadhojat. Sadhojat was pleased with the praises of Brhamaji and blessed HIM with the power of creation. The twentieth kalpa was named Rakta Kalpa. While Bhramaji was ignorant as how to start creation, a heavenly voice advised him to meditate. While Brhamaji was in deep meditation state, his body turned red (Rakta color). From HIS body Aadi shiva appeared in physique form. This avatar od Shiva was in red complexion. 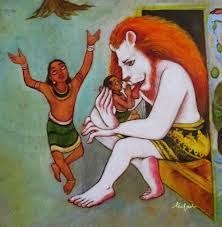 On seeing HIM, Brhamaji praised him with great devotion and named Him Naamdeva. Pleased with the praises, Naamdeva blessed Brhamaji with the power of creation. The twenty-first kalpa was known as “Peetvavasa Kalpa” In this kalpa, Brhamaji was yellow in color. 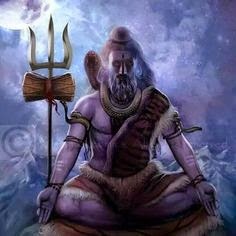 On the state of deep meditation, Aadi Shiva appeared from his body. This avatar of Aadi Shiva wore yellow color clothes, yellow turban and yellow sacred thread, his arms were abnormally long. As Maheshwar opened his mouth, a divine Cow appeared from it. The cow had four head and possessed 32 qualities. The cow was named Gayatri. Brhamaji recognized HIM as Shiva and praised him with great devotion and chanted Shiva Mantras and Shiva Gyatri. 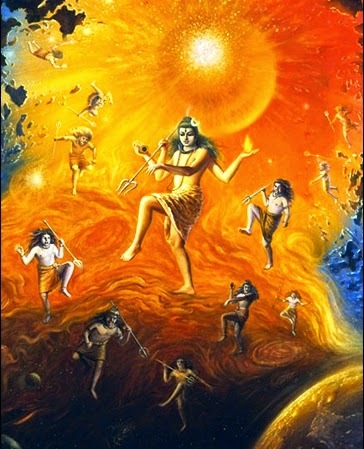 After chanting, Shiva was very pleased and many entities appeared from HIS body, each yellow in color. Brhamaji named HIM Tatpurasha. Then Tatpurasha and all the entities blessed Brhamaji with the power of creation and art of Yoga. Peet kalpa was followed by Pradhritta kalpa. Black was the predominant color of this kalpa. 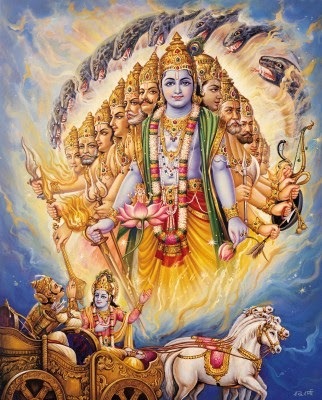 Initially, the whole earth was submerged in the water and Lord Brahma desirous of commencing his creations meditated. As a result, a divine Shiva appeared from his body. The complexion of this avatar was black in color. Not only had that he put on black apparels and a black crown on his head. A black sacred thread was hanging across his shoulder. 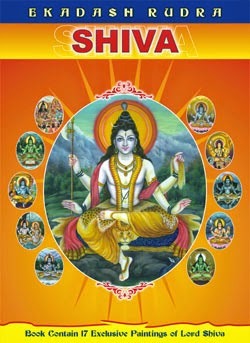 Brhamaji immediately recognized Shiva and praised him with full devotion. Four more entities appeared from Aghoreshewar which were too in black complexion and resemble Aghoresh in every respect. With the beginning of the new kalpa, Universe was submerged in water; Brhamaji desirous of creating was engrossed in deep meditation. A divine Cow appeared in front of Brhamaji. Actually the divine cow was nobody other than Vishwaroopa Sarswati. Brhamaji failed to recognize the cow and continued with meditation. Aadi Shiva appeared befor Brhamaji. Brhamaji immediately recognized HIM and praised HIM with full devotion. Pleased with devotion and prayers, Shiva told that I will be called Ishan in this kalpa. This Kalpa will be known as Vishwaroopa Kalpa. This Kalpa originated from left side of my body and is the thirty third Kalps in line. The divine cow has also originated from me and is Godess Gauri – source of all creation. All of them were divinely luminous like Ishana. They all blessed Brhamaji with the power of creation. It is interested to note that the viraat roop (Vioshwaroop) shown by Shree Hari to Arjuna in Mahabharata, didn’t had Shiva in HIM. 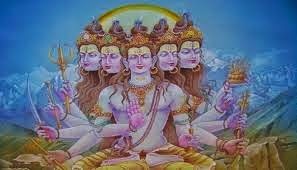 But Vishwaroopa shown by Sada Shiva to his Ganas during battle with Andhak had Shree Vishnu in it. 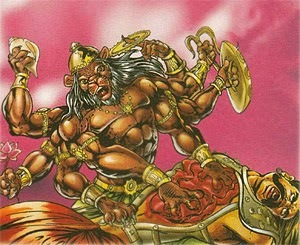 As seen here that 4th Rudra is named Shankar and his Consort is named as Uma, it is this Rudra Shree Krishna mentioned. “AMONG THE RUDRAS I AM SHANKAR”. Aadi Shiva was not the part of this Viraat Swaroop. 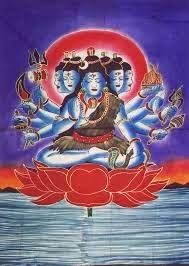 This symbolizes that Shiva controls whole universe.